Contents 2 Black message boards with 7 letter tracks on one side, 2 reversible Special/Sale headers, 22 - 8" numbers with the percent symbol (2 of each number/symbol), 314 - 4" letters, numbers, and symbols (consisting of 3 sheets of letter inserts and 2 sheets of numbers/symbols inserts). 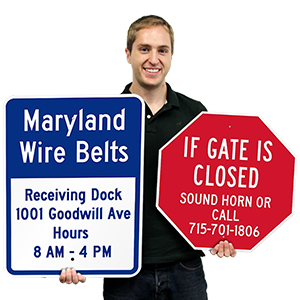 Looking for a customizable message board with inserts for a sidewalk sign? You have come to the right place. Order our Black Add-A-Message Board to display your customized message to everyone. • Add-A-Message board stand up to moisture, wind, temperature, minor abrasions, and more. • Board is perfect, indoors and outdoors. • With modular letters, numbers and symbols, create your message on 24" x 36" 2-sided message board that displays 7 lines of copy. 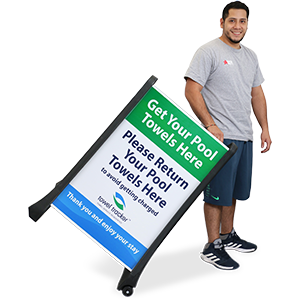 • Multifaceted insert kits can be used with our A-Frame Sign Holder or generic 24” x 36” Signacade plastic frames from Plasticade. 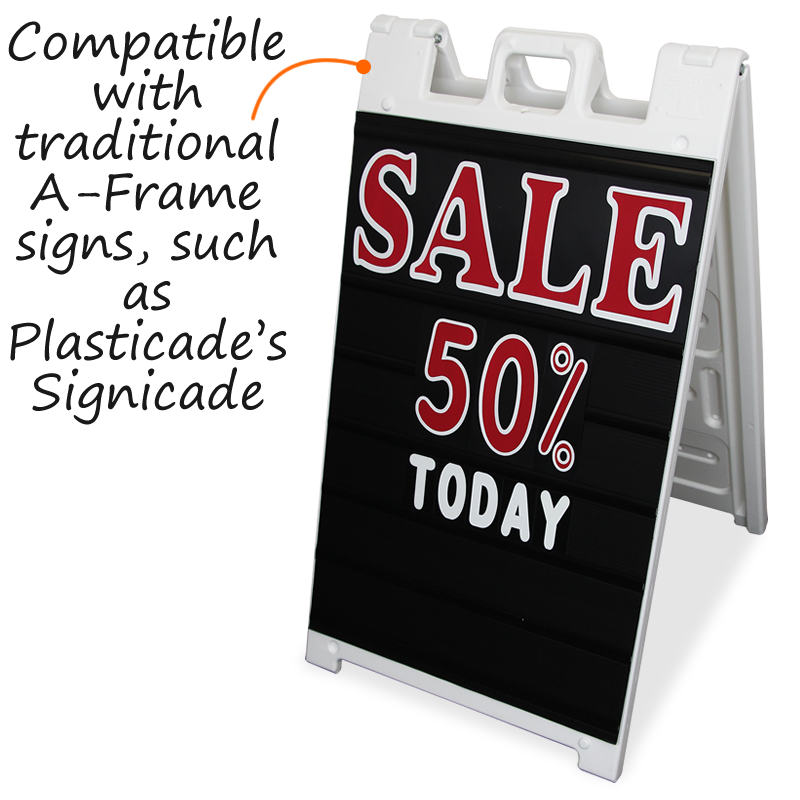 • Converts any 24” x 36” QLA™ A-Frame Sign Holder into a 2-sided Message Board sign that displays 7 lines of copy. 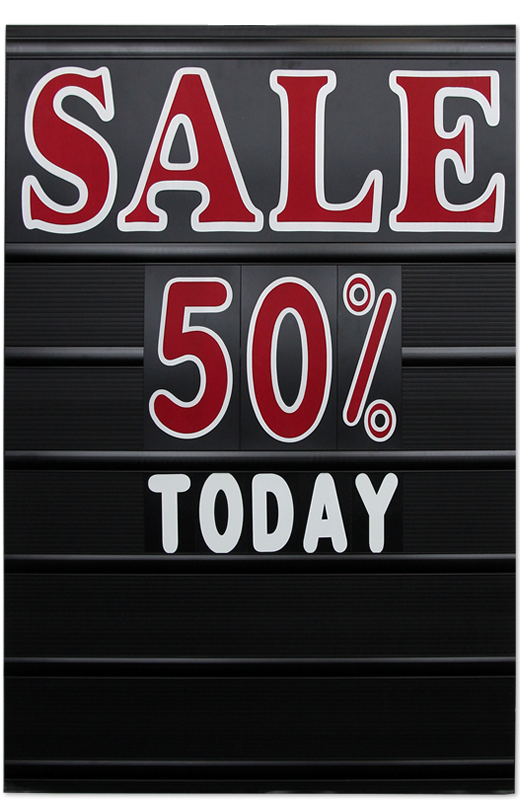 • Two 24” x 36” x 3/16” (600 x 900 x 4mm) White or Black sign faces with letter tracks on one side. • One set of 314 - 4” letters, numbers and symbols (Black letters & Red numbers for White boards or White letters & Red/White numbers for Black boards). 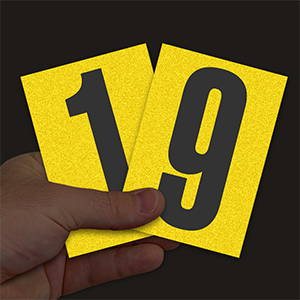 • One set of 22 - 8” numbers with the percent symbol (Red for White boards or Red/White border for Black boards). • One set of 2 - 9” double-sided headers, “SALE/Special” (Red for White boards or Red/White border for Black boards). • Message boards are perfect for display indoors and outdoors. They are weatherproof and resist fading in sunlight.